Lying ethereally amongst the tranquil forest of Ta In (Ta Hine commune, Duc Trong, Lam Dong) is the mighty waterfall of Jráiblian (also known as Bao Dai waterfall) with its unique mysterious beauty. 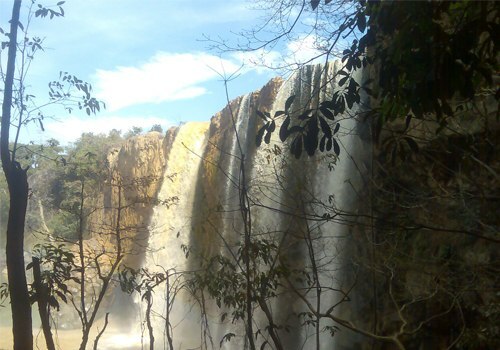 The waterfall itself and the surrounding landscapes of wildlife are indeed a potential tourist attraction in Lam Dong in general and across the Central Highlands in particular. 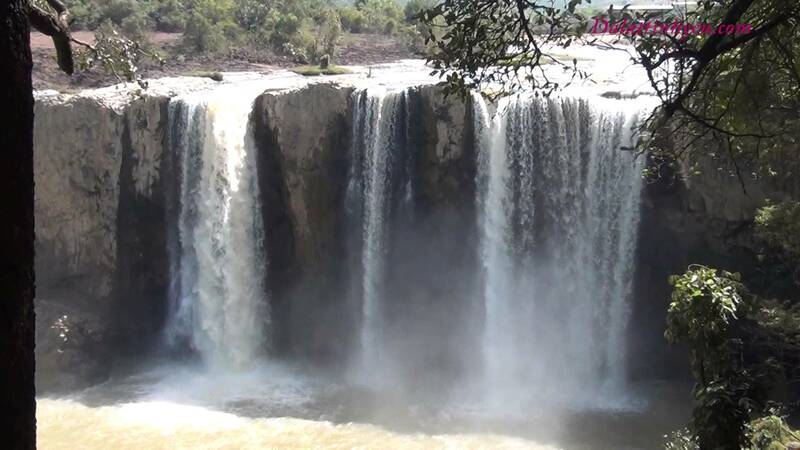 Indigenous people from Churu ethnic minority named the waterfall "Jráiblian" which means "the waterfall of giant stone". Sometimes the fall is called "fallow waterfall" for being rarely visited except on some special occasions. 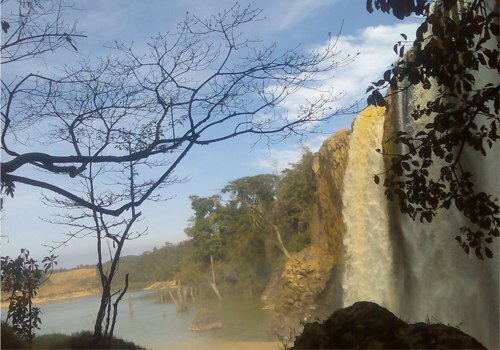 From the T-junction Ta Hine (Highway 20, 40 kilometers away from the city of Da Lat), tourists should turn over the path to the hydropower of Dai Ninh toward Phan Thiet City about 29 kilometers and then turn left and keep the routine of 3 kilometers to reach the waterfall. From the cliff of 70 meters in height, a strong current of water divide itself into three smaller branches fiercely discharging into the stream bed. The image of water jets chasing each other and plunging down as fast as arrows is absolutely miraculous. Even staying away the fall about two or three kilometers, tourists can easily hear the gorgeous roar of water. The waterfall foot is totally covered with a plain of large stones, some of which do remind visitors of interesting imaginations. Those weird-shaped stones are legendarily believed to be the remains of petrified birds, animals and even human beings who gathered here to listen to the magical sounds from the holy crocodiles. In contrast with the fierce waterfall is the poetic scenery on the bank. At the right side of the fall on the sheer cliff lies an old banyan stretching down his long arms of branches as if playing with the water. Meanwhile, the track on the left leads to a stone cave with its steep slope like a trench to the inside of the fall, which will evoke the curiosity of adventurous visitors. 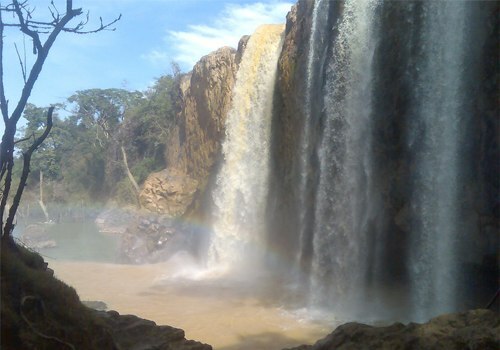 The waterfall of "Jráiblian" as being called by Churu people has another name: Bao Dai waterfall. 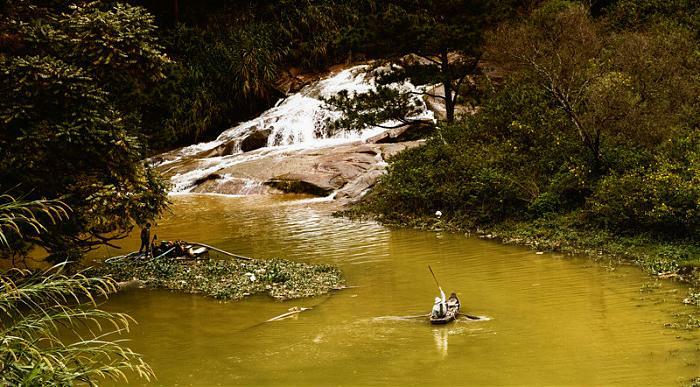 In past, when Dalat still belonged to the Dynasty of Nguyen (1950), Emperor Bao Dai (the last emperor of Vietnam) often took rest around this fall bed in his hunting trips, so that some people have called it "Bao Dai waterfall". Bao Dai waterfall is considered to be as high and enormous as the falls of Pongour and Gouga with its unique wild and rustic features like Elephant waterfall. The fall is surrounded with zigzag cliffs, forming the attractive cave-like slots. The flora here is appreciated highly with various rare species of quite good reservation and protection. 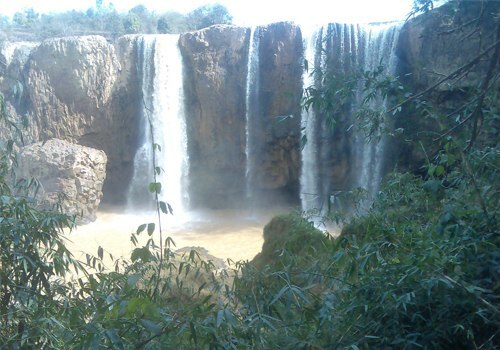 Due to the convenient location, Bao Dai waterfall is an ideal site for camping, picnics and outdoor activities. Several tourism enterprises and investors have been positively restored and embellished the main road to the fall, built more terminals, stone gardens, etc. The complete work is expected to be in operation in 2011. Bao Dai waterfall was recognized the national landscape in April 13, 2000 under the Decision 06/2000/QD-BVHTT by the Ministry of Culture and Information of Vietnam. 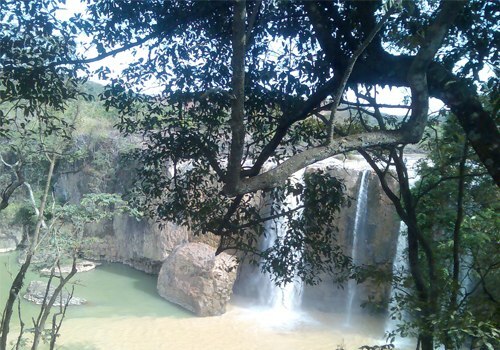 From the highway of Dai Ninh - Luong Son (specifically the T-junction of Highway 20, Dai Ninh), turning around 9 kilometers over a police station, then taking another left turn of 3 kilometers is Bao Dai waterfall. The fall of common days is quite desolate and deserted with nothing else but the lonely sound of water and melodies from birds. However, as an unwritten rule, on every Second day of the first lunar month, generations of Churu people flock to the fall, holding interesting games and activities. 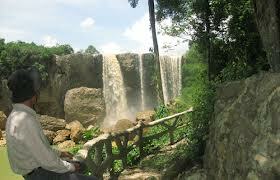 Bao Dai waterfall of today is an ideal destination of tourists with great love to nature and adventurous activities. With a surface area of 2,600 hectares, the waterfall is both a poetic ecotourism site and a natural center of discovery activities and thrilling games, such as kayaking along the stream, swimming through the fall and around the fall foot, canoeing around the lake of Dai Ninh, etc. Visiting Bao Dai waterfall, tourists will have special opportunities to immerse in the unique wild nature of one of the most terrific jungles in Vietnam. There is also a touching myth that has been passed through generations of Churu people about the birth of Jráiblian fall. That is about a man who was transformed into a crocodile after eating a weird egg. The crocodile died soon with his tongue sticking out. Water around overflew the tongue, making miraculous melodies which were much better than any instrument. All creatures, from animals to local people, were so deeply fascinated by the sound that they neglecting their jobs, forgetting to eat and to sleep, to enjoy the magic music. Consequently, they starved to death. Cham's King then ordered 100 men to draw the tongue out of the crocodile's body. The tongue, however, was getting longer and longer and immediately jerked back, throwing the men off balance down to the abyss of death below. Sympathizing with those poor people, God sent a black bird to tell them a hint: using a string made of an old man's skin. When the King was hopelessly looking for a volunteer, an old man with a cane appeared and offered a sacrifice. The King was greatly moved, holding a sumptuous banquet to show his deepest attitude to the old man. The dead man's skin was then twisted into a rope. The rope smashed the tongue indeed with its splinters thrown out everywhere, even sticking on the surrounding bamboo trees. That's why bamboo trees were capable of creating melodies and have been used to make instruments. But the tongue still remained its three large pieces, of which one turned into the mighty waterfall of Jráiblian, one was thrown into Tu Tra (the present district of Don Duong) and one was the spring of Ma Bo.